Water heater leaks can occur for a variety of reasons. It may be something as simple as a slightly open drain valve to a severe issue such as a corroded hot water tank. Most of the time, a water heater leaking is due to faulty plumbing connections or valves that have failed. At the very least, a leaking hot water heater is an annoyance. If not properly addressed, this small nuisance can quickly turn into a major problem. While a small amount of water may seem harmless, it may eventually cause severe water damage to walls, floors, and subfloors if the leak is not taken care of quickly. In the worst cases, the area around the water heater could even experience flooding. What could have been a quick, inexpensive fix has now turned into costly repair bills. In addition to water damage, serious health issues can arise due to mold and mildew growth in those wet, damp areas. According to the CDC, children, those with severe allergic reactions, or immune suppression are at highest risk of experiencing medical issues from exposure to mold. With a water heater leak, you want to make diagnosing and fixing the problem a high priority. The leak won’t magically go away on its own no matter how much you hope, so read on to learn what you should do. Is your hot water heater still leaking after repairs? WARNING: Before reading further, keep in mind that the water inside a water heater is most commonly heated to 125° F and possibly up to 190° F if set to its highest setting. Any water temperature in this range can cause severe injuries and even first degree burns on even the lowest setting. Always take extra precautions to avoid any contact with the heated water. Obviously, if water is spraying out of pipes connected to the water heater, you have an issue. It’s the other signs of water that are often difficult to find the source of leak (if there is one). Sometimes, normal condensation from the water heater tank, pipes, or a nearby appliance is the culprit if you notice a small pool of water around the base of the tank. This is usually more noticeable during winter months when the inlet water temperature is especially cold or when filling the water heater for the first time. Once the temperature of the water in the tank has a chance to heat up, the outside condensation generally goes away. If you’re convinced it’s not condensation, closely inspect any plumbing to the water heater, valves, and the tank itself. If the leak is not obvious, use paper towels to wipe down all wet areas and take some time to observe to see if any area shows signs of water. Fortunately, water has to obey the laws of gravity so start from the top and work your way down. If you still don’t see signs of the leak, lay some paper towels in the area you originally found dampness and come back periodically to inspect. If the problem doesn’t reappear after a day or two, it’s most likely nothing to be worried about but it’s best to keep an eye on it for a bit. After confirming your water heater is actually leaking, you should immediately turn off the power source before you do anything else. When you’re dealing with water and electricity, bad things can (and do) happen. Natural gas has its own dangers as well. Electric Water Heaters – Go to your circuit breaker box and turn off the breaker switch for your water heater. If for some reason your electrical panel’s breakers aren’t labeled, shut off the main breaker just to be safe. Gas Water Heaters – Turn off the gas supply to the water heater. Look to the side of or behind the water heater for the gas supply line and follow the line to the gas supply valve. Turn the valve clockwise until it stops so it is perpendicular to the gas line. Note that if you have not yet confirmed that the water heater is the source of the leak, you should leave the water supply ON to help you locate the leak. If the leak is serious enough where you cannot safely get to the shut-off valve, you will need to locate the main shut-off valve for the house. In cooler climates, the main water line often enters through the floor of the foundation to keep the water from freezing. The main valve is located near this area next to the water meter. In warmer climates, the main shut-off valve is normally next to the water meter in an outdoor box with an access cover or near the street. You may need a large wrench or curb key to close the valve. It’s a good idea for every homeowner to know where the main water shutoff is BEFORE an emergency occurs. The temperature and pressure relief valve (aka: “T&P valve” or “TPR valve”) is an important safety device that’s a part of every standard electric or gas water heater. This valve is located at the top of the water heater and is connected to a pipe that runs down the side of the tank. Its purpose is to relieve pressure by letting some water out (usually a cup or two) in case the water inside the tank gets too hot. Water expands when it is heated and the water tank can actually explode if the pressure relief valve is stuck closed. When you suspect a leak from the pressure relief valve, it is either defective, the connection from the T&P valve to the water tank is not watertight, or it is simply doing its job of releasing excess tank pressure. With the later, you don’t necessarily have a leak but possibly a more serious issue that should be looked at by a professional. Replacement of a bad pressure relief valve is pretty straightforward. Examine both the cold water inlet and hot water outlet connections at the top of the water heater. Many times, homeowners will find that one of the pipes or fittings is slightly loose and not watertight. Simply re-tightening with a pipe wrench is often all that is needed to fix the issue. The possibility does exist in older homes that deteriorated pipes are causing water to leak. If you suspect that, then it’s recommended to call a plumber so they can determine the extent of the damage. Near the bottom of the tank is the water heater drain valve (usually plastic but also brass). It is used to drain the water tank for maintenance or to remove sediment. Sometimes this valve gets loose and just needs tightening. 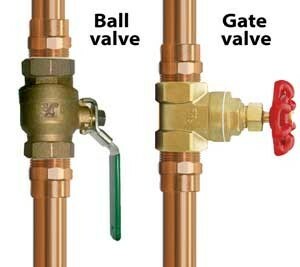 Other times, the valve may become defective and require replacement (easy DIY job). For a quick temporary fix to a leaking drain valve, simply screw on a garden hose spray nozzle or hose cap. Not too common, but on electric water heaters, the gasket around the heating elements may become worn or pinched and cause dripping leaks. You will need to open the cover plate(s) on the side of the tank, push aside the insulation, and check around the gasket for any leaks. Like other appliances, a water heater has a limited lifespan, which is generally about 10-15 years. To see how old your water heater is, you’ll need to look up its age. Over time, sediment inside the tank starts to break down the interior of the water tank and rust starts to form. This rust then starts slowly eating away at the tank walls until a leak develops. When an internal leak occurs due to corrosion and deterioration, replacing the water heater with a new one is really the only option. Out with the old and in with the new. Often, when you feel like your water heater is not heating, it’s actually due to a water tank leak which allows hot water to escape and be replaced with more cold water. Once you’ve determined where the leak is coming from, you need to decide quickly if you want to repair it or replace your old water heater with a new one. Just because you found the leak doesn’t mean it will stop leaking by itself. Many repairs or part replacements on a water heater are fairly easy to do yourself but if you have any doubts, please call a professional. For many, time is money, and even though you have the skills to do it yourself, hiring a plumber is still a better option. If you do decide on making the repairs yourself, see the section below on how to fix a leaking water heater. If your water heater is over 10 years old, it’s often best to simply replace it than put more money into repairs and then have it fail a couple years later. While water heater replacement can be done yourself, it’s highly recommended to let a licensed plumber do the job. WARNING: Do not attempt to repair your water heater unless you feel completely comfortable. With plumbing, a small leak can quickly become a much larger problem resulting in a much more serious leak, flooding, and even water damage. Water heater repairs should only be done at your own risk. If you have any doubt, let a plumber handle it. There are a couple reasons why the temperature and pressure relief valve (T&P valve) could be leaking, making it a common source for the leak. Most likely, you may have a faulty pressure relief valve or debris inside it are preventing it from operating correctly. This is especially true with older water heaters. If the T&P valve is leaking at the connection to the water tank, you may simply need to tighten the connection. If that doesn’t work, Teflon tape should be wrapped around the threaded connection to the tank. Do accomplish that, you’ll essentially need to follow the same instructions as if you were to be replacing the pressure relief. The most common cause of leaking pipes at the top of the water heater is due to a loose connection. To fix, simply take a pipe wrench to tighten the connection. If after tightening, it continues to leak, a section of piping may need to be replaced which may require the help of a professional. If water is running down from the pressure relief valve, through the overflow pipe and to the floor, it’s possible that too much pressure is being built up inside the tank and the pressure relief valve is doing its job draining some water to relief this pressure. If this excess pressure is not released, the water heater tank could literally explode. To determine if excessive pressure in the tank is the cause of the leak, turn the water heater thermostat to its lowest setting, turn on the water supply, turn on the power (or gas), and observe your water heater for a short period of time. If water continues to drain out of the overflow pipe to relieve pressure, shut everything off and call a licensed plumber to have them look at it. This is one of the easiest to fix water heater leaks. First, try tightening the valve connection in case it’s loose. Otherwise, debris may be causing the valve to not work correctly or the valve is faulty and needs replacement. Test by flushing out the drain valve first. Place an empty container under the heater drain valve (or attach a hose and route it outside) and open the valve for a couple seconds. This will flush out any debris that may have been present. Close the valve and check for leaking. If the drain valve continues to leak, an easy temporary fix is to screw on a garden hose end cap or hose nozzle to seal the valve. Eventually, you will want to replace the heater drain valve. Unlike the pressure relief valve, the heater drain valve is not a mandatory safety feature so it’s not urgent that it get replaced right away. But don’t forget about it if you use a temporary fix. Hard to spot since the heater elements typically go through the side of an electric water heater tank and are covered by insulation and an access panel. Over time, the gaskets that seal the water out become worn or brittle and lose their watertight seal and need to be replaced. Follow the instructions on water heater element replacement. If you have an older water heater and cannot pinpoint as to why it is leaking from the bottom, you most likely have a problem with the tank itself and the leak is due to corrosion of the walls from rust and aging. Because of the high pressure inside a water heater tank, attempting to repair it should be out of the question. At this point, the water heater should be replaced with a new one. While this page includes the most common sources and fixes for hot water heater leaks, they won’t cover every issue. Sometimes, replacing a part will still not fix the leak. In these cases, it could be due to a more serious issue and a professional plumber should be contacted.